The cruise takes place at 2pm in most cases and sometimes at 9:30am. The cruise takes place on most days throughout the year. We are comparing Tenerife Half-Day Whales and Dolphins Tour Prices from leading ticket suppliers and Try to find you Cheap tickets prices on the market. The "Tenerife Half-Day Whales and Dolphins Tour" is a pleasant cruise near the coast of the island with watching activities of the sea life. On board the sightseeing ship, tourists will have ample chances to spot and observe playful dolphins, friendly pilot whales and other likable creatures that inhabit waters around Tenerife. In addition to examining the marine life, time is also allocated for swimming in a beautiful environment. During the cruise, the guests can also examine the attractive coastline of southern part of Tenerife Island. The sightseeing cruise also adds dining opportunities with complimentary beers, wines and soft drinks. Furthermore, transfers from the hotels are available for people in the specified areas. This type of activity is suitable for everyone who wishes to have a unique and entertaining experience. Whether you are a fan of beautiful landscapes or the marine life, you will enjoy this sightseeing cruise. Your Experience With Tenerife Half-Day Whales and Dolphins Tour? On this pleasant cruise, you will have an opportunity to admire the beautiful coastline of Tenerife and an amazing sea life. 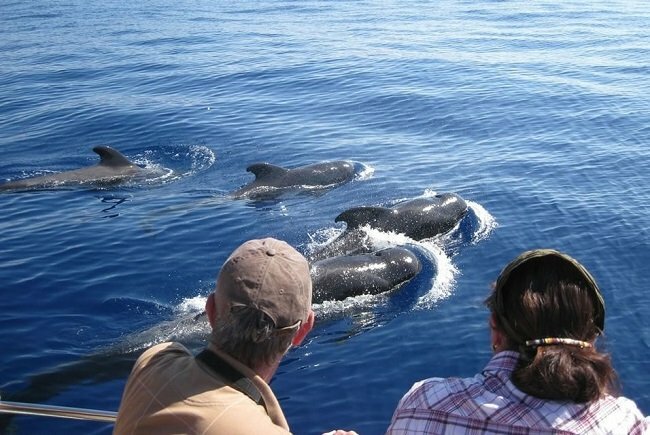 During the tour, you will see pilot whales and bottlenoose dolphins from a short distance if not up close. Also, you will have extraordinary photo opportunities with towering cliffs of the island in the background. Swimming opportunities in a beautiful environment are also available. Before the sailing ends, you will enjoy delicious meals and drinks served on board the vessel. What Tenerife Half-Day Whales and Dolphins Tour Includes? The cruise includes whale- and dolphin-watching opportunities. Also, you will have a chance to refresh yourself by swimming in the place of big natural beauty. Complimentary lunch served with beer, wine and soft drinks. Pickups and drop-offs from southern part of Tenerife (Costa Adeje, Playa de las Americas and Los Cristianos). The pilot whales may come to the boat and swim around. In these cases, you shouldn't make noise in order not to scare them away. Once you stop for a swim, you will have an opportunity to examine colorful marine life. Travelers Reviews about Tenerife Half-Day Whales and Dolphins Tour? The rating of the whale-watching tour on Get Your Guide is 4.6 (out of 5) and 4.5 on TripAdvisor. Most travelers were enthusiastic about the chance to examine whales and dolphins in their natural habitat up close. The majority of them spoke commendably about the crew and its efforts. The sightseeing cruise isn't suitable for people that have disability issues. Both electronic and paper vouchers are valid for taking part in the sailing cruise. In case of timely cancellations, the providers return the entire paid amount. Note that in the case of bad weather or restless sea, the cruise could be cancelled for safety reasons. If so, you will have an option of receiving the full refund or to take part in the activity on some other day. The departure point of the cruise is Puerto Colón, Pontoon 12, Playa de las Américas.